The river system provides a 465-mile river highway, with 36 deep water and inland ports. There are six deepwater ports downriver from Vancouver USA including the ports of St Helens, Woodland, Kalama, Longview, Astoria and Ilwaco. There are no dams between Vancouver and the Ocean, but four upstream between Vancouver and Richland, including Bonneville, The Dalles, John Day and McNary. The dams and locks make navigation possible. Full grain barges and empty oil and gas barges…with yellow smiley faces…head downstream (and visa versa). 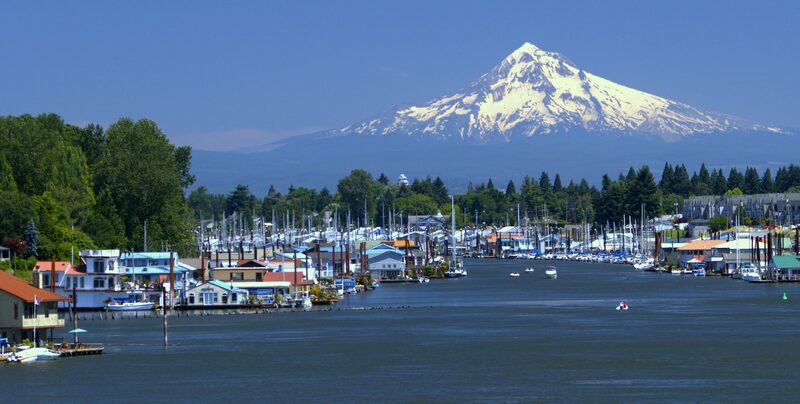 is the largest city in Oregon and a major port, at the confluence of the Willamette and Columbia Rivers. The city covers 145 square miles and had an estimated population of 639,863 in 2016, making it the 26th most populous city in the United States. Here are 35 Portland tourist attractions and 17 Things To Do in the Portland Area For Less Than $10 (or Free). RiverPlace in Downtown Portland, is along the Willamette River and the Marquam Bridge (which carries I-5) to the south. The Portland Streetcar and MAX Yellow/Orange Light Rail run through the area which includes a floating restaurant, marina and boutique shops. A photography exhibit “Made in Chinatown USA: Portland” at the new Portland Chinatown Museum, reveals many interesting stories.